Poor Jew ice cream. Got hand it to the Russians for their great sense of awareness. A Russian ice cream company is drawing criticism from members of the international Jewish community for a new dessert named “Poor Jew”. 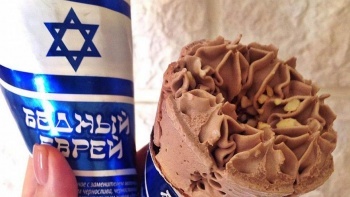 An advert on Russian social media states, “Introducing the ice cream ‘Poor Jew,'” Try all this deliciousness, it turns out that he is not so poor.” The cone may not be poor, but it’s surely tasteless. In a social media post announcing the ice cream’s launch on Feb. 28, the company describes it as a “crusty horn” filled with chocolate- and prune-flavored ice cream and topped with peanuts. Prune-flavored ice cream my be a matter of subjective preference, but most will agree that the real problem is with the product name and packaging. The brand Slavitsa wraps their pre-packaged ice cream cone in an Israeli flag, also featuring the Star of David, symbols of Judaism and modern Jewish identity. The cone made Russian national news after the head of a Jewish community in the western town of Naberezhnye Chelny – 600 miles east of Moscow – blew the whistle. Leonid Shteinberg has called the name “racist” and demanded its production and sale be halted, Radio Free Europe/Radio Liberty reported. Related: Read about really good “Jewish” ice cream from Tel Aviv that uses hummous as a base. “Who allowed them to offend national feelings?” Shteinberg told the news website Tatar-inform.ru. He also threatened to sue the factory if they don’t stop production of the ice cream. Slavitsa’s director responded by saying, “Look at the sales! People love it! 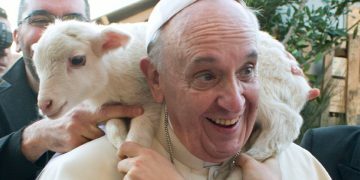 At the end of the day, it’s clear that this Jew is not poor at all,” making reference to the ice cream’s commercial success. The city prosecutor’s office has opened an investigation into whether the ice cream maker used the name “Poor Jew” and the Israeli flag legally on its packaging. The Slavitsa company has long demonstrated questionable taste. They were previously criticized for creating a chocolate ice cream named after then-President Barack Obama, which had a wrapper depicting an African boy, and for naming another ice cream with an ethnic slur for Ukrainians. Next Next post: The 100 most Jewish foods!